A sad story from our railways: Ian Faletto, an award-winning stationmaster at Lymington Pier, Hampshire, saw a shopping trolley on the railway lines, which had the potential to cause an accident. He requested that the power be turned off, and then jumped on to the lines in protective shoes to remove the trolley. Unless there is some other aspect to the case which South West Trains is not willing to reveal, it would seem that Mr Faletto's very enthusiasm has made the authorities uneasy. The rest of us, however, could do with many more public employees like Mr Faletto, who appear – within sensible limits – to be even more concerned about other people's safety than their own. A South West Trains spokesperson said an employee had been dismissed for a “serious breach of safety” but refused to officially explain what this was. “This action was taken following a full and thorough internal investigation and the decision was also upheld at an appeal hearing,” he said. This didn't stop the Mail and others deciding South West Trains were definitely in the wrong. 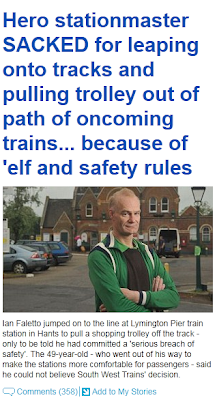 It was 'all down to elf 'n' safety' and an over-reaction from 'Elf 'n' safety tyrants'. The sacking of Mr Faletto is beyond disgusting. Whoever runs South West Trains should be thoroughly ashamed. He should be reinstated immediately with a grovelling apology. And that was that. The media moved on. A railway worker who claimed he was sacked for removing a shopping trolley from the track has withdrawn his claim of unfair dismissal. But after he was presented with new evidence, his counsel advised him to drop his claim, prompting a strongly-worded statement from SWT. It described the allegations by Faletto as "fictitious, Walter Mitty-style claims" and the company stressed he was not paid off. ''We are pleased that Mr Faletto has finally withdrawn his case, which proves definitively that there was never any substance to the claims he made. ''However, we remain angry at the way these fictitious Walter-Mitty-style claims were so quickly reported as fact. It is also doubly upsetting that many well-meaning people in community were so misled. ''This was a matter of principle and integrity and we were fully prepared to outline the truth to the employment tribunal. ''We are confident that they had heard all of the evidence, they would have found in our favour. For the avoidance of doubt, we have made no payment to settle this case and nor have we ever considered doing so. ''As we have maintained all along, this case involved a serious breach of safety. The fact is that there is no evidence to show that there was a trolley on the track, as Mr Faletto claimed, and the safety of our passengers was not compromised at any point. ''The only safety risk was caused by Mr Faletto's foolhardy actions in knowingly stepping down onto an area of live track for no justifiable reason. ''No 'trolley' incident was recorded in the station log or reported to management at the time - or even when Mr Faletto was first questioned by management. ''There was no evidence either of any call to a signalman or station. ''We are not interested in a box-ticking or jobsworth approach to these issues and the decision to dismiss Mr Faletto was not taken lightly. Mr Faletto does, however, stand by his version of events. The BBC, Guardian and Mirror all reported that Faletto withdrew his unfair dismissal claim and quoted Kelly's statement. Given that that happened several days ago, it looks unlikely the papers who did so much to champion Faletto six months ago are going to update their readers on the case. I am shocked--*shocked*--that this bloke's claims, and those made by the papers, turned out to be nonsense. I imagine the reason he's sticking to his version of events because the full story hasn't, and probably won't, come out. Regarding the press coverage, and current lack of, you could PCC complaint it; but by now it's so irrelevant it might not do any good. 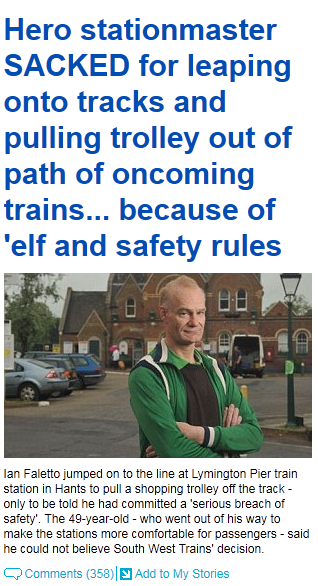 If you were able to gauge how far this particular elf 'n' safety story has integrated into the larger myth, then it could be worth a try (though the 3rd party 'rule' may trip you up). People may still remember the story. As we know, the papers won't correct the old stories unless forced. These tales are great for them: kick up a fuss over nothing -> enrage readers -> profit. Not having to apologise because the complaints system is so inadequate is a bonus. This is exactly the kind of thing which editors are attempting to sweep under the rug at Leveson. If the public ever knew the sheer scale of deceit in the press there'd be uproar--and if anyone reported on that, we might get somewhere. But busy schedules and confirmation bias form a considerable obstacle for those who want to get that message out. I'm in a pessimistic mood. When this story came out I commented on here or on angry mob that there was much more to this than met the eye. If I can see that why can't national newspapers? Trouble is our media is unable to challenge anything that goes against their agenda. The good thing is, noone is going to vote with their custom and take their morning commute with a different train company because of this. Very curious to know the real story. A dare perhaps? Dropped his phone? "Trouble is our media is unable to challenge anything that goes against their agenda." Let me correct that - They have no interest in challenging anything that goes against their agenda. I wonder what the "new evidence" was? CCTV footage perhaps?